The Champion Sports FitPro Ball with Stability Legs promotes good posture while sitting at home, at the office, or at school! Made of the highest quality Italian resins, this ball is burst resistant, and provides ergonomic benefits by using trunk and abdominal muscles for core strengthening. It can also be used for stretching or exercise, and the four legs prevent the ball from rolling away. 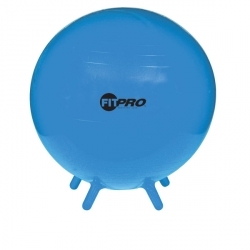 We offer the FitPro Ball in four sizes.